IN 1787 THE NORTHWEST TERRITORY was formed, encompassing all lands north and west of the Ohio River. A Recorder’s office was established in each county. Ohio became a state in 1803 and although the state constitution did not provide for a Recorder’s office, the first state legislature mandated that a Recorder be appointed in each county by the Judges of the Court of Common Pleas. In 1829 the Recorder’s office became an elective position and in 1936 the term was established at four years. TODAY THE COUNTY RECORDER KEEPS AND MAINTAINS accurate land records that are current, legible and easily accessible. An important aspect of the Recorder’s work is to index each document so it may be readily located. Accurate indexing makes it possible for persons searching land records to find the documents necessary to establish a “chain of title” (history of ownership) and ensures that any debts or encumbrances against the property are evident. These invaluable records are utilized by the general public, attorneys, historians, genealogists and land title examiners. In some counties, certain property is registered under the Torrens Act. This “registered land” has boundaries certified to be correct; title is guaranteed by a state insurance fund. Torrenized land records are the responsibility of the County Recorder. In 1998, working with the Clermont County Commissioners, the process to “abolish” registered land began. After public hearings and an act signed by the Recorder and Commissioners, registered land was abolished on February 2,1999. All Registered Land certificates will be kept in the Recorder’s office. No updates will be made to those certificates. DOCUMENTS RECORDED IN THE RECORDER’S OFFICE ARE GENERALLY CONSIDERED TO BE PUBLIC RECORDS. INFORMATION CONTAINED WITHIN THESE RECORDED DOCUMENTS IS ACCESSIBLE TO THE PUBLIC, UNLESS SPECIFIED OTHERWISE BY THE OHIO REVISED CODE. ALL RECORDS ARE RECEIVED, KEPT, AND PRODUCED BY THE RECORDER IN ACCORDANCE WITH THE OHIO REVISED CODE CHAPTER 317. RECORDED DOCUMENTS WITH UNENFORCEABLE RESTRICTIVE COVENANTS EXIST. 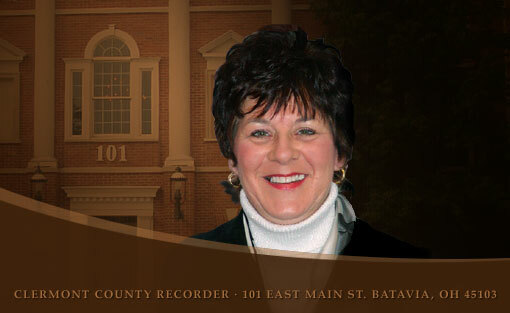 THE RECORDER’S OFFICE MAKES NO REPRESENTATION REGARDING THE CONTENT OR ENFORCEABILITY OF ANY DOCUMENT, INSTRUMENT, OR OTHER RECORD KEPT BY THIS OFFICE, AND THE RECORDER HAS NO AUTHORITY TO ALTER OR REDACT THE CONTENTS OF, OR OTHERWISE DELETE ANY RECORD RECEIVED OR MAINTAINED BY THE RECORDER EXCEPT AS SPECIFICALLY AUTHORIZED PURSUANT TO OHIO REVISED CODE CHAPTER 317.